Read more about Previous Blog Posts Restored! One of the most interesting things I’ve discovered going through our John Falter collection in the last few years is how and how much of his personal interests, friends, and environs manifested themselves in his art. Jazz is a great example. Falter loved jazz from an early age and was a talented self-taught musician (clarinet and piano to be sure–perhaps even other instruments). As a teen in Falls City he played in a band with George “Pee Wee” Erwin, who went on to a successful career as a jazz trumpeter. The jazz theme appears in his teenage sketch/scrapbook . . .
As I mentioned in a blog post a few weeks back about a Superman comic book, the Nebraska State Historical Society collects and cares for hundreds of thousands of items not all of which are particularly old. We feel it is important to collect items now that will allow us to examine important issues in our state that will have long-reaching impact. One important debate being played out in Nebraska today has been the potential placement of Transcanada’s Keystone XL pipeline across our state and the Ogalala aquifer. Superman has been a lot of places, so when DC fans in Omaha were promised that he'd be visiting their city they were understandably excited. It's too bad he ended up overshooting by about 60 miles. Cape, jacket, and skirt made by Nettie Vertrovsky of Crete and covered with buttons from her collection. (NSHS 7329-4,5) (at right). 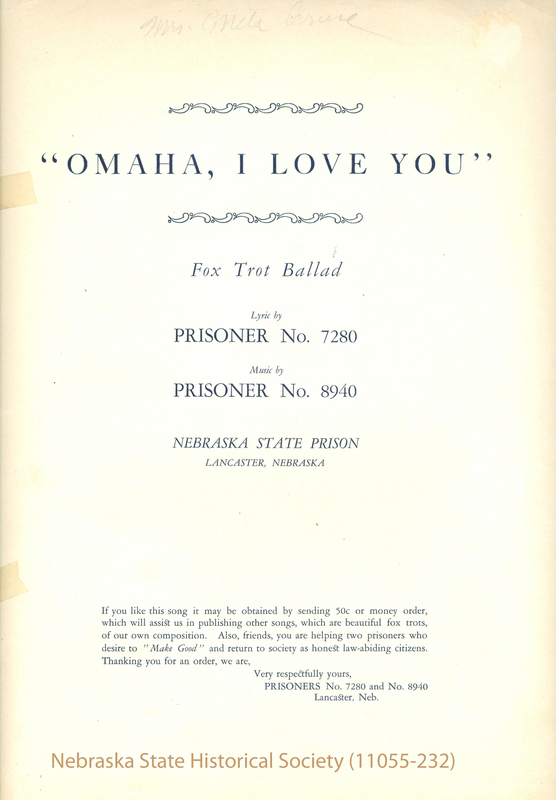 The Society has a large collection of Nebraska-made/Nebraska-themed sheet music. While cataloging some a few weeks back I came across two pieces that piqued my interest–mainly because the composers were identified only by their prisoner numbers.